Developing a career strategy in a world defined by technology and global competition is an extreme challenge. Today’s “knowledge workers” now have to ask the question: Am I providing incremental value over Google? Rapid technological advancement is making that a higher and higher bar. On the plus side, we live in a world with exponential growth around every bend. Learning to do just one value-added activity can be exceptionally wealth-enhancing in a world with technology and a global community of more than 3 billion Internet users. A theme of this chapter is that technology and a global marketplace open up possibilities for individuals to harness exponential growth in their careers like never before. An important part of career strategy today is putting yourself on the right side of exponential growth. The beauty of exponential growth is that it presents asymmetric risk-reward. A person who invested in Facebook at its IPO (or, better yet, started working there in the early days) had limited downside but unlimited upside. Whenever possible, strive to put yourself in these spots, where the gains to be had are far bigger than the potential losses. Want to read more? 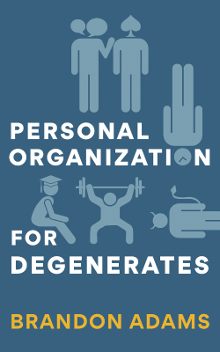 Check out my new book Personal Organization for Degenerates.